[:en]Come Join us at Old Stone Station on Thursday December 7th for Hospitality Night! Gather around the fire pit in our Beer and Wine Garden and stay warm while enjoying some of our Homemade Clam Chowder. 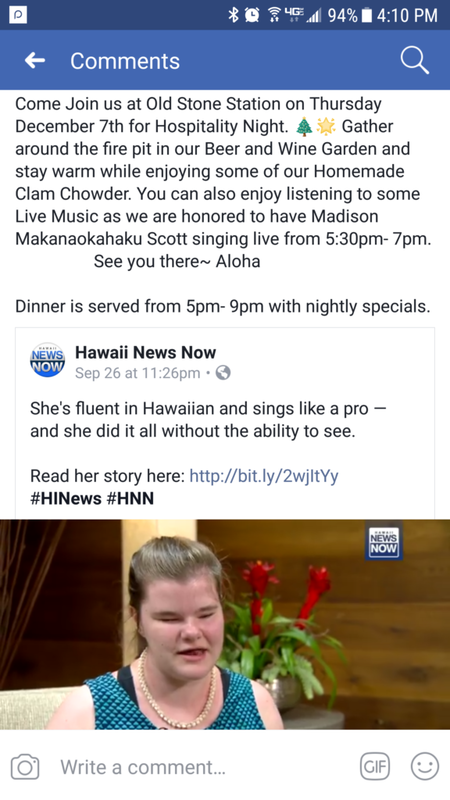 You can also enjoy listening to some Live Music as we are honored to have Cambria resident Madison Makanaokahaku Scott singing live from 5:30pm- 7pm. Dinner is served from 5pm- 9pm with nightly specials.